One Product A lot of Applications! The Landscaping Spray Glue is a real all-rounder with countless applications. The Landscaping Spray Bottle can be used for a variety of different applications. To enable you an easier removal of the rock from the cast, you can apply a release agent (20 parts water, 1 part detergent) with the Landscaping Spray Bottle to the mould before casting the form concrete. 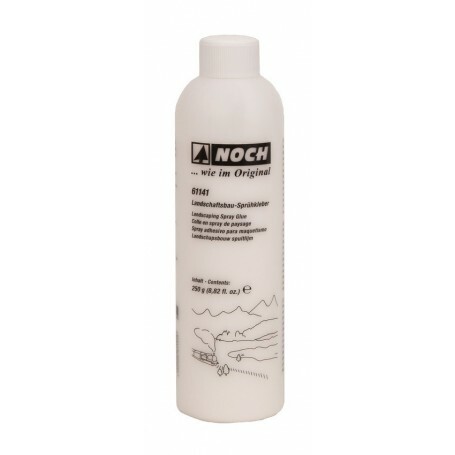 Furthermore, the Landscaping Spray Bottle is ideally suited for applying heavily diluted paint to the plastered rocks. Application 1 »Adhesion«: For flocking bushes, trees and shrubs, the tree structure is sprinkled with the Landscaping Spray Glue and then flocked with leaves, flock or structure flock. After the drying process, the tree is sprayed once again with the Landscaping Spray Glue in order to fix the leaves. Application 2 »Fixation«: After loosely applying the material (rubble, ballast, flock, etc.) you want to fix, subsequently spray it with the Landscaping Spray Glue. After drying, you may add and fix additional layers, in order to increase the materials volume. Application 3 »Sealing«: Ensure finished objects (such as flocked trees, bushes or designed vegetation) are sealed permanently by spraying the Landscaping Spray Glue. This way you can increase the objects durability and stability. The Landscaping Spray Glue is delivered ready-for-use and it dries transparently. The nozzle of the Landscaping Spray Bottle fits onto the Landscaping Spray Glue.